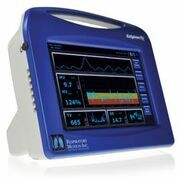 Respiratory Motion, Inc., developer of ExSpiron, the ONLY patient monitor measuring non-invasive Minute Ventilation, critical for early identification of potentially life-threatening respiratory depression. “Repeated studies show the ExSpiron Patient Monitor is more effective than current technologies for identifying subtle changes in breathing that rapidly indicate life-threatening respiratory depression." Respiratory Motion’s ExSpiron 1Xi™ was launched by IMI Co., Ltd. at the Japanese Society of Intensive Care Medicine at the February 11th – 14th conference. The Japanese Society of Intensive Care Medicine (JSICM) was founded in 1974. Physicians joining the JSICM have specialized in intensive care with past experiences as anesthesiologists, emergency physicians, cardiologists, and pediatricians. The ExSpiron patient monitor provides non-invasive monitoring for Minute Ventilation, Tidal Volume and Respiratory Rate. Knowing a patient’s minute ventilation, how much air they breath in one-minute, is essential to knowing their respiratory status. ExSpiron is the ONLY respiratory device to provide this comprehensive information for non-intubated patients enabling a more complete and quantifiable patient assessment throughout the care continuum. ExSpiron technology was first introduced to the Japanese market in 2015 in lectures given at several conferences by prominent physicians. safety. Respiratory Volume Monitoring (RVM) can detect patients at risk for opioid-induced RD and/or experiencing post-operative apnea. EtCO2 measurements in non-intubated patients are unreliable so clinicians resort to using the respiratory rate (RR) measurements from the capnograph. Normal EtCO2 coincided with adequate RR just 24.9% of the time. Data demonstrated that relying on capnography to capture the respiratory status in non-intubated patients is lacking. Monitoring respiratory rates as low as 6 breadths/min would still miss nearly 90% of Low MV episodes. RVM can identify and quantify respiratory compromise in the PACU, ICU, or GHF. Respiratory depression poses a significant threat to the safety of patients in Japan, where aging population and economic pressures have pushed hospital systems to embrace novel technology to eliminate preventable adverse events and contain cost. As in the United States, health care providers in Japan seek ways to identify patient risk before it becomes life-threatening. Repeated studies show the ExSpiron Patient Monitor is more effective than other technologies for identifying subtle changes in respiration that foreshadow life-threatening respiratory depression. “The footprint and scope of IMI, our distribution partner in Japan, provides us the platform to rapidly reach physicians and patients”, says Diana Gelston, Chief Commercial Officer for Respiratory Motion. “Our strategy is to collaborate with the best companies with exceptional relationships, talent, and knowledge in their respective markets, and IMI certainly achieves that for us. IMI is among the first in a series of international partnerships to launch the ExSpiron, Non-Invasive Minute Ventilation monitor. We see many of the same issues in patient care abroad as we do in the U.S., which the ExSpiron uniquely solves. We look forward to helping clinicians save lives through quicker respiratory intervention in many markets.” says Gelston. The U.S. Department of Health Services' Agency for Healthcare Research and Quality finds the annual costs of respiratory insufficiency, arrest and failure was $7.8 billion in 2007. This makes respiratory issues the third most rapidly increasing hospital inpatient cost in the United States. Further, Healthgrades 2014 Patient Safety Report lists post operative respiratory failure is the largest single source of avoidable in-patient days. Respiratory minute ventilation is used to monitor the amount of air actually breathed by a patient in one-minute, which is fundamental to knowing a patient’s respiratory status. In 2012, Respiratory Motion won U.S. Food and Drug Administration clearance for its revolutionary ExSpiron monitoring system. Respiratory Motion, Inc. is a medical device company based in Waltham, MA, that develops innovative technology to monitor respiration and help clinicians and hospitals improve patient safety and outcomes. The company’s monitoring systems can identify patients who are at risk for life-threatening respiratory depression. This allows physicians to prevent the dangerous condition before it harms a patient.